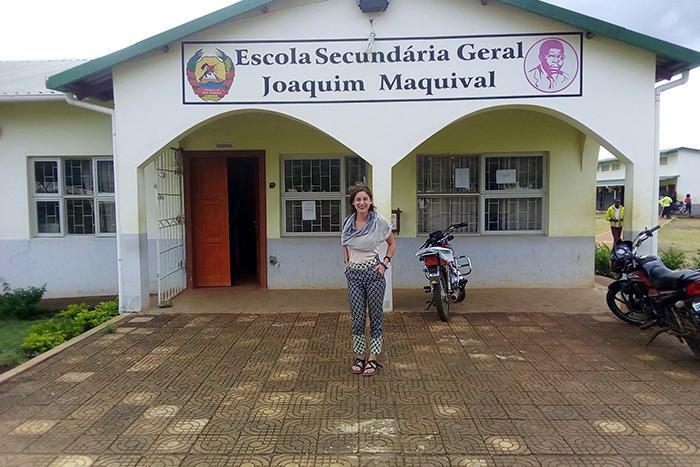 Jacqueline Shore '17 at the school where she teaches English in Mozambique. Since the Peace Corps’ founding in 1961, more than 250 Dickinsonians have served abroad as volunteers. The Peace Corps ranks its top volunteer-producing colleges and universities annually according to the size of the student body. An interactive map showing where Dickinson alumni are serving is available on the Peace Corps website. Dickinsonians are currently serving in Benin, Botswana, China, Liberia, Mozambique, Peru and Ukraine. Peace Corps volunteers work at the grassroots level with local governments, schools, communities, small businesses and entrepreneurs to develop sustainable solutions that address challenges in education, health, agriculture, the environment and economic and youth development. At the end of their service, volunteers bring their knowledge and experiences back to the United States. This week, Aaron Williams, director of the Peace Corps from 2009 to 2012, visited campus to discuss volunteer service with students and meet with Dickinson President Margee Ensign. Dickinson has long been a leader in international education, with 31 semesterlong and academic-year programs in 24 countries, as well as a full range of short-term, faculty-led programs, including the distinctive global Mosaic and globally integrated courses. Nearly 60 percent of Dickinson students study abroad, while nationally only about 10 percent of college graduates do so. On campus in Carlisle, international students and visiting scholars share views from around the world, while global diversity courses and 13 foreign languages are taught as core parts of the curriculum. Dickinson’s recent international accolades also include winning the 2019 Senator Paul Simon Award for Comprehensive Internationalization, becoming the first college in the country to earn the honor twice. The award, given by NAFSA: Association for International Educators, is considered to be the pinnacle of achievements in global education on campus and abroad.